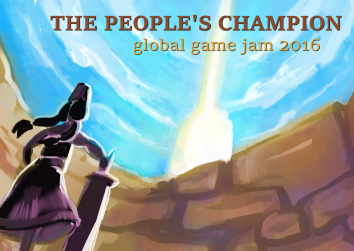 The People’s Champion was made at the 2016 Global Game Jam hosted at Cogswell Collage. The theme for this year was “ritual”. The idea is that you are the strongest child of your village and must take part in ritual combat to prove yourself and attempt to ascend to god-hood. The game’s style is reminiscent of classic beat-um-ups like golden ax and double dragons. I started this game based on a simple question: “how would I make a bullet hell type game in Unity?” (for those of you unfamiliar with the bullet hell genre see Touhou Project as the classic example). The basics of the game is the player dodges and shoots down barrages of enemies until they reach a boss with a reasonably predictable pattern of attacks consisting of lots of projectiles. While the enemies take many hits to eliminate the player is not so durable and will be killed in one hit, so learn enemy patterns and predict what they will do in order to win. The player also has a super bomb that clears the screen of projectiles and deals lots of damage to enemies. As with most of my games this project started with a question. “How would I make a top down shooter in Unity?” The first problem I saw was keeping the player in a set space, and my first solution to this was to simply put a box around the player just outside of camera sight. 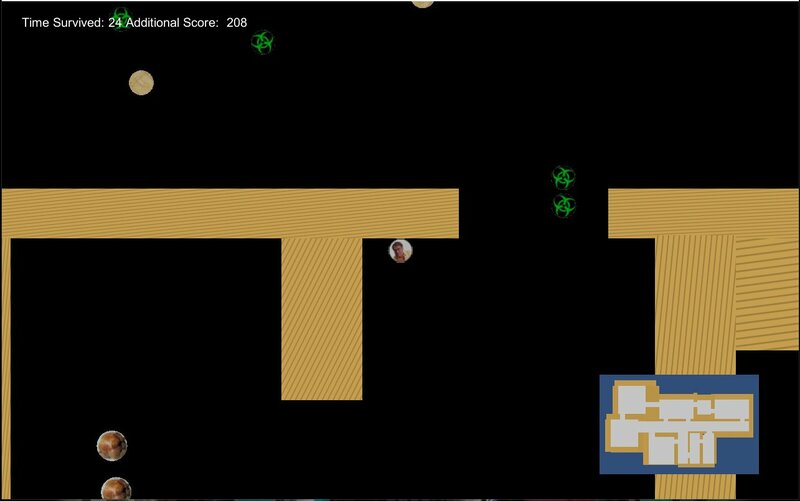 The next question was “how do I make the player feel like they are moving?” The answer I came up with was to move the boxed area past background images and to move those images in front of the player when they left the view area in a leap-frog like fashion. Now I had the problem of making the enemies, my projectiles, and everything except the player not collide with the constraining box. This answer was also rather simple as I was making a 2D game in a 3D environment I simply placed things on different Y (up and down) coordinates. Some of the problems I was encountering however arose primarily from the constraining box, mostly from the fact that it didn’t work very well. Upon revisiting the problem I made a simple adjustment to the moment controls stopping movement if the player hit specific X and Z coordinates. 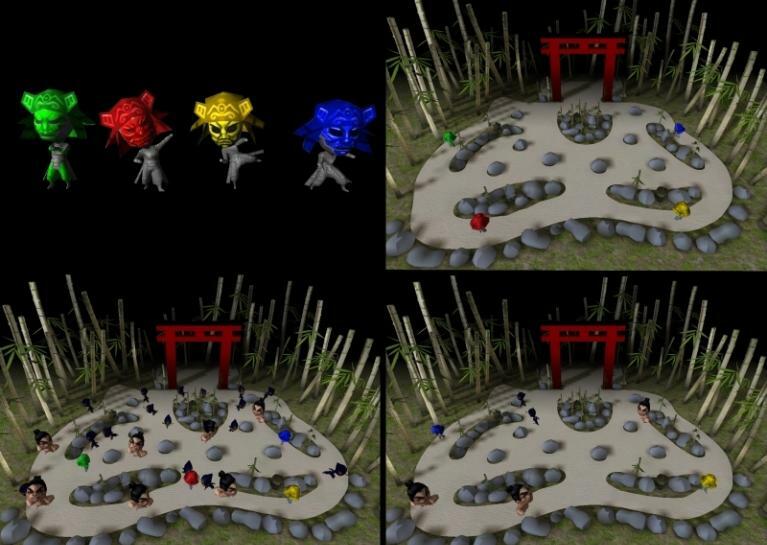 Kabuki Theater was made as part of the 2014 Global Game jam at Cogswell Polytechnical College. Team members where: Darrel Atienza, Mitch Thompson, Peter Djeu, Dylan Greek, Phillip Easton,and myself. In Kabuki Theater you play as one of up to 4 samurai who send ninja to kill the other samurai. Only one problem, you can’t tell which ninjas you hired and which ones are after you. Zombie Tag is one of the games from my Project Playground that I have decided to flesh out more. This game started with me wanting to familiarize myself with the A* Pathfinding Project. The “Humans” randomly move towards points distributed around the map, every few seconds these characters chose a new location to move towards, this gives them an aimless, shuffling, almost panicking feel as they don’t seem to know where they want to go. The “zombies” have a similar pathfinding mechanic to the humans but can also track the player character, and the longer they are active the more likely it becomes that they will hunt the player. The player must try to avoid the zombies but will inevitably be overwhelmed as the hoard grows and eventually starts to actively hunt them down. In an earlier iteration of this game the player also had to contend with a clock that would count down the time the player had remaining before game over. The player could extend this clock by collecting “food” drops that spawned around the map. This mechanic was intended to prevent the player from simply sitting in a corner or finding and exploiting any problems with the pathfinding. However I found that it did not improve the enjoyment of the game. So instead of counting down your “time left” the clock now counts up your “time survived” and collecting the “food” drops now give bonus points. I originally was just playing around with the A* Pathfinding Project but decided to make a handful of games based on games played on school playgrounds. I started with a version of tag where the chasers spawn regularly. A few obstacles help you evade the chasers and necessary as chasers are faster than the player but turn slowly so in a one-on-one environment the player couldn’t out run them but could dodge to the side and watch the chaser go running past. An interesting thing I observed is that as more chasers are spawned they seem to gain a kind of “swarm inelegance” because they would crowd around an obstacle trying to chase the player and some would go around the other way because they are pushed around and it becomes a shorter path. After creating the Tag game I came up with the idea of the playground games and decided to create a dodge ball game. 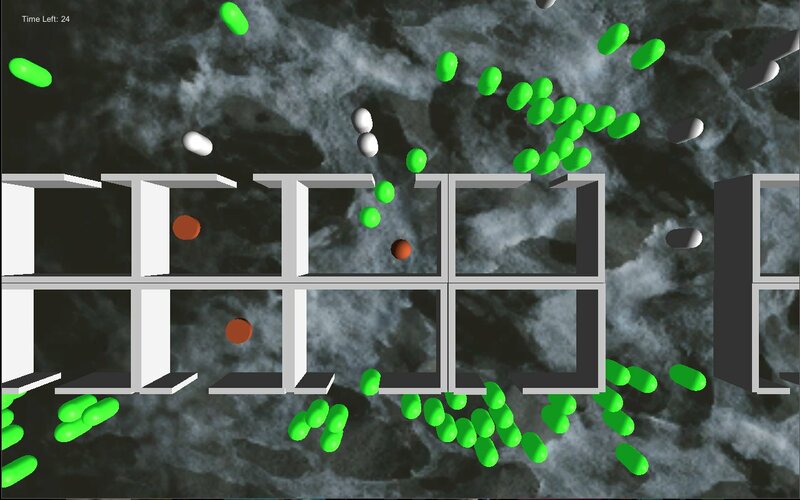 In this game the projectiles are “loaded” until the player launches them. 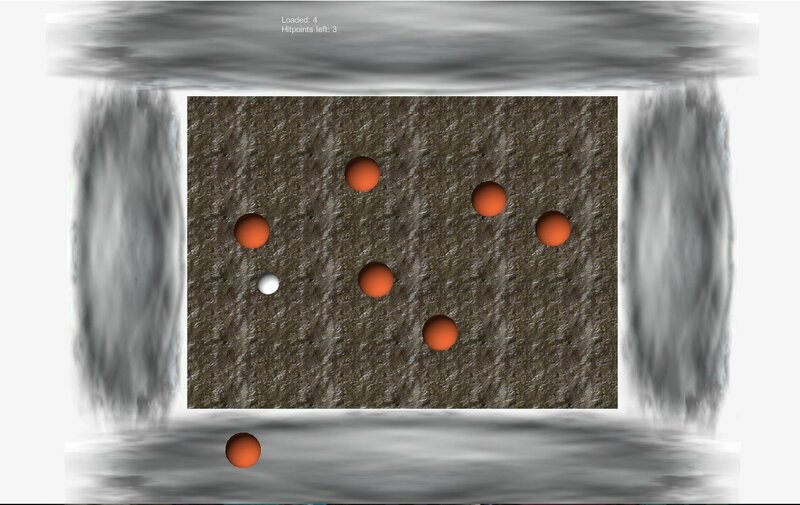 At that point the balls are launched from points that are circling the play area at different ranges pointed at the player. Points are scored only after all the balls are launched. I discussed the more refined Zombie Tag above so this is more of a less refined version with a different map and still had the time limit mechanic. 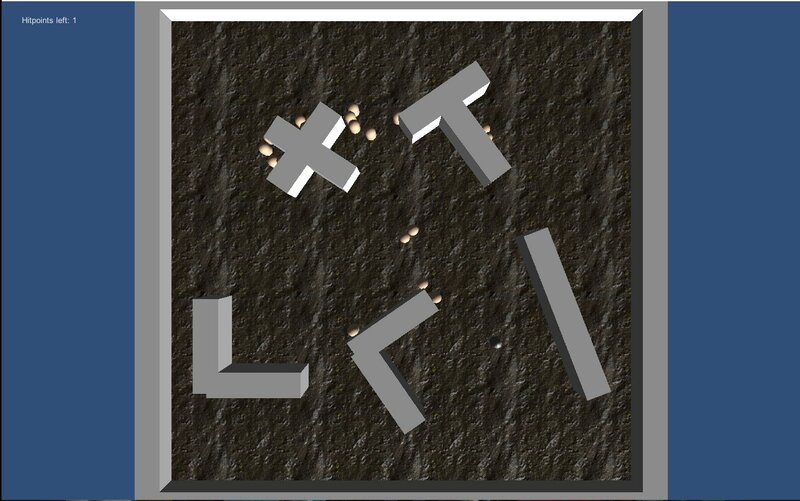 A puzzle game I have been developing reminiscent of the lever challenges from RPGs where you have to pull the levers in the right order to open a path. 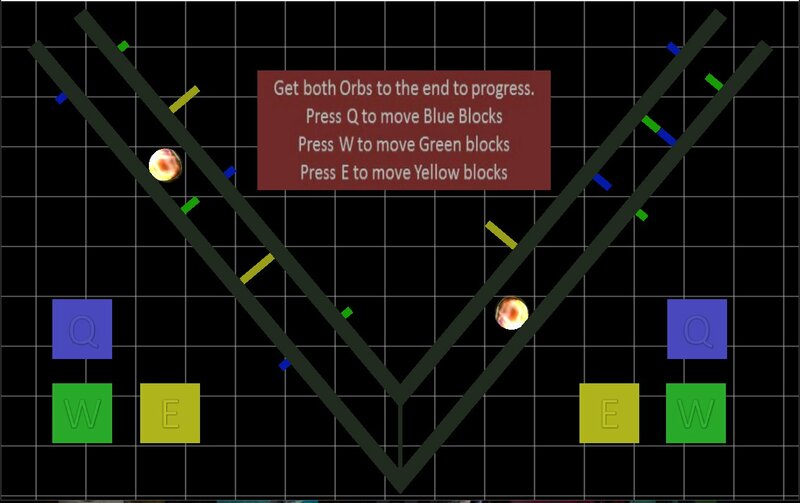 In my game you are trying to get orbs to reach the end of a path while preventing other orbs from doing so. This is a very early prototype with “programmer art”. The aim was to get it playable as soon as possible. 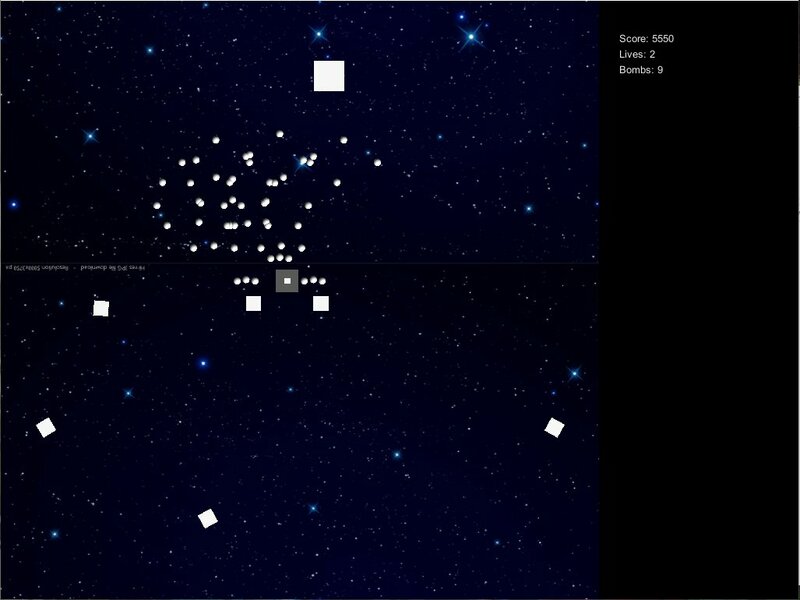 The game is intended to be played in a 16X10 aspect ratio and won’t display correctly in other aspect ratios. 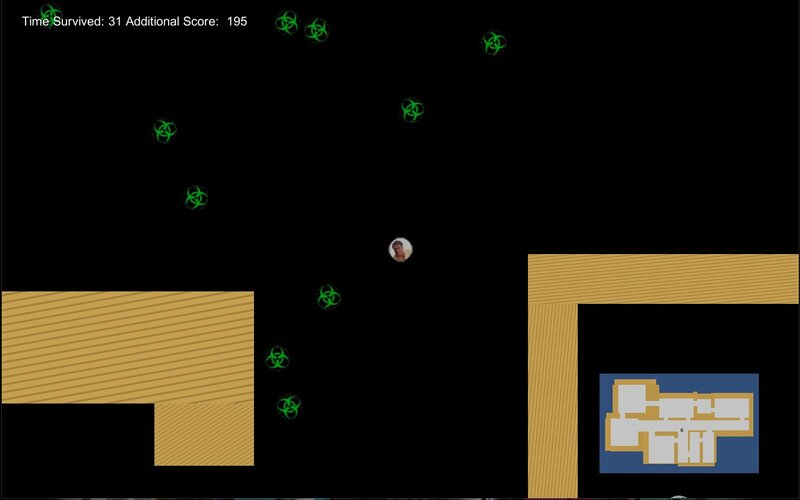 Clock Runner is a game I developed as my senior project for Cogswell College. I was playing with the idea of time allowing the player freeze most objects to pass by certain problems. The key was making it so the user had to decide when to let time run so certain activities could still be accomplished, vs. when to stop time all together. A few of the obstacles where inspired by strange physics interactions I found while playing around in Unity. Clock Runner has six levels including a tutorial level. Racer O is the first game I made for Unity. It is a race game against time. Additionally, hitting obstacles loses you time and passing checkpoints will increase your remaining time. This was kind of a proof of concept project, there is only one level and testing grounds. As this was my first Unity game I was testing lots of things and didn’t know what I was doing all the time. Somehow while I wasn’t looking the file for the Mac version got managed to acquire some problems and so is no longer available and the sounds seem to have broken. I am unlikely to go back and fix these problems as I am far more inclined to work on new projects, however I might re-visit the idea for this game in the future. The car model and texture were made by a fellow Cogswell student. I wish I remembered his name so I could give him credit but sadly I do not. All other visual assets where either made by me or where Unity default assets. Sound effects were found online.